This past week, the wife and I got invited to a financial seminar (something about retirement) at Ruth’s Chris Steakhouse which is one of the high-end steak houses in Bellevue. We are both going, and I think we are allowed to invite two more people because they sent us invitations for four people. It’s pretty common for us to get invited to these things. We live in the wife’s parents’ home, and the various marketers know people’s ages around the neighborhood. So they’re always inviting the wife’s parents (by mail) but we go instead (heh, heh, heh) . In the past we’ve gone to two financial seminars, and one for solar panel installations. We’ve never bought anything, but they are still interesting. Plus, you get a free meal. Previous ones have included McCormick and Schmick’s in downtown Bellevue, and Maggiano’s. Anyhow, the dinner is free (!!!) and we’ve invited 3 other couples, and all three have turned us down due to other commitments. I literally can’t even give these free tickets away for Ruth’s Chris Steakhouse. They are mostly looking for older people. Half the invitations we are not allowed to use because it says "Please, no attendees under 40." Lately I’ve been thinking a lot about how I (and the wife) travel. Those three trips were not cheap. We flew regular airfare, stayed in normal hotels (or Vacation Rental by Owner, VRBO), and bought food frequently at restaurants. We’ve been much more successful in driving down our costs in the later years than in the earlier years (both when I was single or married). It’s done through multiple methods. First, I get to travel for work. I volunteer to go to conferences, but I also research them and present my bosses with the estimated cost, and the justification for why I should attend. I am also active in the email community so people know me, and they invite me to participate in panels or present at the conference. When you are asked to present, and if I ask early enough to go, I usually get permission to attend. I understand work’s travel budgeting process, and I really am one of the best people from my team to attend. I bring a lot to the industry, and I bring a lot back. This means that when me and the wife travel, my flight is covered, and at least part of the food and lodging is, too. So that reduces part of the cost. Second, we’ve gotten good at reducing flight costs in other ways. If you sign up for a credit card, you often get a sign-up bonus of 25,000 to 50,000 (or even 100,000) bonus points once you spend a certain amount within 3 months, which is easy. Sometimes you get a free ticket, or travel companion ticket. The wife and I have signed up for multiple credit cards over the past couple of years and taken advantage of the airline points (I even flew my sister down on airline points). That also helps to reduce the cost. It hasn’t affected my credit rating, either. And since I no longer have a mortgage and have no plans to acquire more debt, even if it did I wouldn’t care (unless it meant I couldn’t get another card, but usually it means the interest rate is higher and that’s no problem because I pay in full each month). That’s another way to reduce the cost of travel. Third, we don’t stay in hotels most of the time. For long term trips, nothing racks up your travel costs more than hotel bills. Whereas a flight may be $1000 for a trip to Europe, or $500 domestically, a hotel can run you $200-$250 per day in the United States and Europe. 5 days and you’ve exceeded your flight cost for overseas travel. To get around this, we now use AirBNB. These are often 1/3 to 1/2 the cost of a hotel. This makes it much easier to slash the cost of your lodging (if you travel to see family, the cost is usually free; but you can’t go see family or friends everywhere you go, and you don’t want to overstay your welcome). Fourth, the lodging can help reduce the food bill. Part of the reason traveling is so expensive is that you have to pay for all of your meals, and that costs far more than when you are at home. To get around this, we again leverage AirBNB. We will stay in places with a kitchen (if long-term) or provide breakfast. If it has a kitchen, we will frequently buy bread, milk, coffee, and fruit so we can eat breakfast in the hotel/AirBNB. Then we also sometimes pack a small lunch, although half the time we eat that are are still hungry by 1 pm. Still, it reduces the overall cost of food by about 20%. So there you have it. Using a combination of techniques, we’ve gotten good at international or long-haul domestic trips at keeping costs under control. I was decent at it before, but we’re really good at it now. If you’ve been following the news the past couple of days, one of the big headlines is that the United States’ intelligence agencies asserted that the Russian government interfered in the recent Presidential election, and that they attempted to tilt it in Trump’s favor. Donald Trump shot back, casting doubt on the agencies’ competency – “These are the same ones that said Iraq had weapons of mass destruction”, meaning that since they had no credibility in the past, why should we believe them now? He also said that hacking is too hard to verify after the fact. Well, for one thing, those two things aren’t the same. For another, it’s quite obvious that the Russian government was involved in the attacks; hacking can be hard to verify but not always. Sometimes the trail is clear, and it is in this case. Trump pushes back on this because, first, he doesn’t believe (or want to believe) that he could be manipulated. Second, by consenting that Russia did hack the election, it undermines his victory – the only reason he won is because a foreign power interfered on his behalf, and he wouldn’t have done it on his own. This undercuts the Trump brand of winning. That’s roughly the argument for why the hacking matters, and why Trump doesn’t believe it. Instead, I want to look at Trump’s statement after the intelligence briefing on Friday, Jan 6, 2016. He issued denial after denial that Russia was involved in any capacity. He used to say Russia wasn’t involved. And now after seeing the evidence he still can’t say they were. But he did mention them in conjunction with China hacking (which is true), other countries (also true), and other groups of people (still true) as trying to break into the US’s cyber infrastructure. By mentioning Russia alongside others who are also known to hack the US, he is effectively conceding “Okay, you’re right” to the US intel agencies. He concedes that Russia hacked the Democratic National Committee, but he also buffers that by saying that it didn’t affect the election… which implies that his victory is not undermined, and therefore cannot be delegitimized. It also doesn’t undercut his brand. He called for a plan to be done in 90 days to combat hacking. Why do this if it wasn’t a big problem? I can’t tell if Trump is being genuine or not. If he is, that is why it is a bad idea to pick fights with intelligence agencies. They don’t fight back directly, they do it passive-aggressively. The leak documents to reporters who whip up the public and distract you from your message as you spend time having to deflect from media circuses. Yet Trump is not that naïve (I’m pretty sure he isn’t). If he didn’t know that’s how the game is played, he does now. He went to Twitter to distract from his concession, and instead tried to flip it as fake outrage that the report even leaked at all. Trump is good at that – using Twitter to distract others in order to cover weaknesses. That’s why he started ranting about the new Celebrity Apprentice with Arnold Schwarzenegger having lower ratings. People would chase that instead of his concession. That’s not what the intelligence agencies said, they didn’t say that the hacking had no effect, they said they don’t know how much it affected it – from no effect whatsoever to giving the election to Trump (in such a close election, especially in 3 mid-western states, small things matter). Thus, while I don’t agree with anything Trump has said recently about hacking, and not trusting the intelligence agencies, and I am not comfortable with his cozy relationship with Russia, there is no doubt that he is fantastic at public relations and turning weakness into strength. 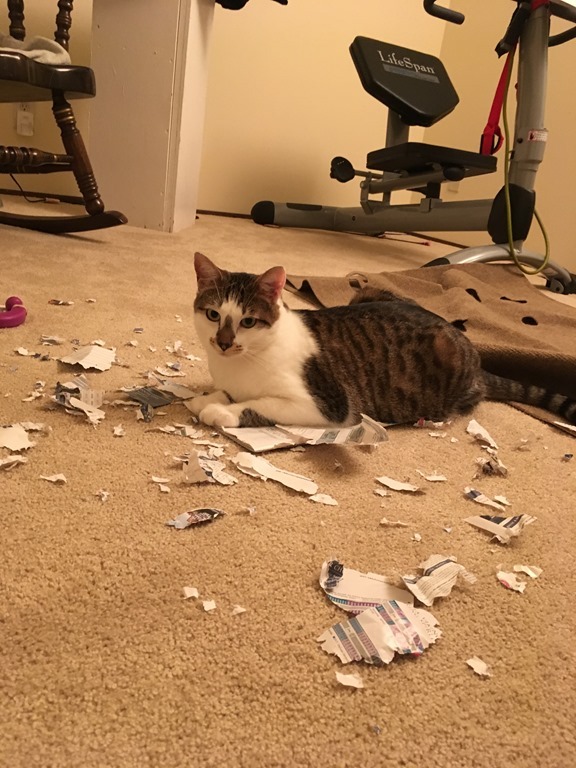 We discovered over the past couple of weeks that we have a paper shredder in the house. This cat sure doesn’t like pieces of paper randomly laying around. She sits on them, chews up the paper, and spits it out. This was a pamphlet for a cruise (my in-laws get them all the time). I guess the cat is not a fan.